FL Homeowners Insurance | Call RTC Insurance at 352-200-2066 and Save. The price of FL homeowners insurance can differ a great deal between insurance companies, sometimes by hundreds of dollars annually. It is important for your peace of mind, and your pocket book that you find a policy that will cover the necessities and the things important to you and your family without emptying the bank. We offer all the competitive companies for you. Simply fill out the form below and we'll show you FL homeowners insurance quotes right away. While you are visiting us, we have outlined a few tips for choosing the right insurance company for your home and family. The first thing to do is give us a little information so that we can provide you with companies to compare and help you find find which one is best for you. Shop around a little with us and ask questions about your new FL homeowners insurance. Think carefully about your needs as a consumer and write it down so you can ask us about them and take notes. Ask your friends and acquaintances who they use and if they are happy with the coverage. If you do not have the time to research yourself, you might be interested in an insurance broker, such as RTC Insurance Advisors. 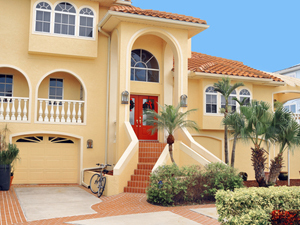 We not only send you an accurate homeowners insurance Florida quote, we help to answer all of your questions. We are Florida-based insurance brokers and will do all the leg-work for you to find you the policy that matches your needs and saves you money at the same time by delivering a quality homeowners insurance Florida quote. For many busy families today, using a good broker such as ourselves, can really save you time and cash. Thus, still providing that all important insurance policy on your home. Give us a try today. The National Association of Insurance Commissioners, or NAIC, also has information that can guide you in you decision-making process. Many states like Florida provide information on insurance rates and possible consumer complaints available to the public, or at least with major insurers. Also, browse through our article archives if you need additional information. It can be found here. Compare rates versus services offered, and do not be afraid to ask questions about coverage and customer service. Many insurance companies also offer various discounts to their homeowners insurance Florida quote, such as bundling your insurance, or paperless billing. There are also special considerations to keep in mind when purchasing FL homeowners insurance in this State. Catastrophic ground cover collapse is mandatory, and you must keep that in mind when shopping for insurance. Take advantage of all the discounts you can qualify for, and pay attention to any new promotions or changes in rates that may affect you. FL homeowners insurance is a necessity for your home. Make the most of the need by finding the right Florida insurance company and policy for your needs. It may take a little time and effort, but in the end it really pays off if you do a little research before choosing. Why not start with us? We know you won't need to go anywhere else. An added benefit is that you will get a quality homeowners insurance Florida quote with us and you will pick up a little extra knowledge about the industry that may come in handy in the future.